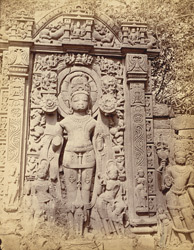 Photograph of a sculpture of Aditya, the Sun god, from Garhwa, Allahabad District, taken by Joseph David Beglar in the 1870s. At Garwa there is a pentagonal shaped compound inside which are the remains of a temple and other structures many of which are now un-identifiable. The North-Western Provinces List of 1891 says, "The oldest remains as yet discovered in Garhwa belong to the age of the Guptas. These are all of pink sandstone and of much a finer grain than the grey sandstone of the mediaeval statues...The sculptures...are remarkable for their bold and and deep carvings, as well as for the good drawing and the easy and often graceful attitudes of the figures...Near the south-west bastion is a small temple containing a colossal figure of Surya [the Sun] and the navagraha, or nine planets." Many sculptures associated with sun worship have been found at Garhwa.